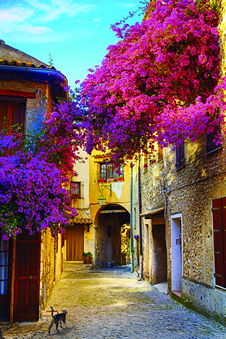 The South of France is legendary for its beauty and charm, its azure skies and brilliant sunlight, and its many layers of history from Roman times to the Middle Ages. Its towns and cities evoke a strong sense of epochs past, and its landscape is filled with vineyards and with the color and scent of lavender fields. We begin this journey into the soul of the region by first traveling to Minerve, a lovely village and significant site in the history of the Cathars. From there we continue to Uzès, one of the most delightful towns on the borders of Languedoc and the Rhone Valley, where the food, wine and elegance have evolved to a high level of artistry. We then visit Avignon, the papal seat during the suppression of the Knights Templar, and travel on to Arles, a powerful center of classical civilization. We then spend two nights amidst the wild beauty of the Camargue with its meandering waterways, flamingos and white horses, and visit the town of Saintes Maries de la Mer, the point of departure for the Holy Land for French crusaders and today a center of major significance for Gypsy culture. We also will visit Aix en Provence, much beloved of the painter Paul Cézanne, and one of the most historically rich cities in the area. Finally, we conclude with a last day in the dramatically mountainous region to the east of the Rhône Valley, amongst lavender fields and the turquoise-green waters and wondrous canyons of the Gorges du Verdon, an opportunity to experience the silence and spirit of this unique place. Includes all accommodations and most meals through breakfast on the 15th, all entrance fees, fully-guided tour, and air-conditioned coach transport.